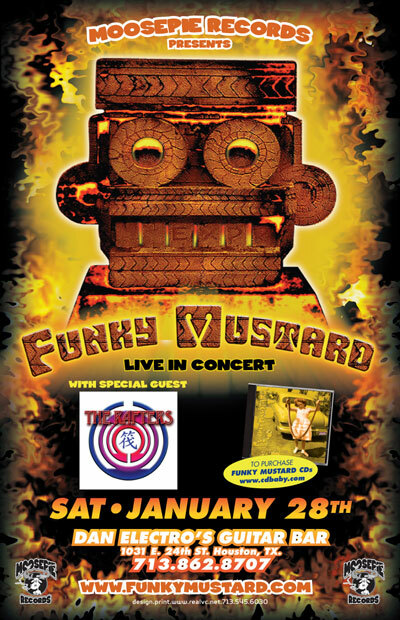 "From the biggest melting pot in the south comes the funky melting pot music of Funky Mustard. Houston, Texas breeds 'em different and these guy's are the perfect example of different. Born from the partnership formed by Kevin Crenshaw on drums and Larry White on lead vocals and guitars, they are the by-product of a couple of different local cover bands from Houston. Both of their self-taught styles are evident in their playing, never following any rules laid down before in rock music. With the unique solo effect of the harmonica provided by Robert Taylor, their music is spun into an all new frontier. Robert's vocals also add a unique twist to their writing style. Gardner Headrick on bass adds hard rockin' rhythms to every song and his method of attack, and sustain brings the rhythm to a solid foundation. They consider themselves a rock band foremost but don't be surprised if you hear some Toots & the Maytals or Jaco Pastorious seeping out of this rock solid band. Recognized as one of the best new bands coming out of Texas, these guys really do bring a song to life with several different mood's to pick from with original songs to wake up to like 'Nine Mile' or that perfect driving home song 'Heysoos.' Prepare to be taken to an all new music zone." Click here to listen to a sample of Amsterdam. Hear more samples and buy Traiga la Paz - Bring the Peace at CDBaby.Com. HoustonBands.Net used to feature a Houston area band every few weeks. Click a band name below to view past feature bands.